sportsmatrix » Can Benfica End More than 50 Years of European Pain? Twelve months can feel like a lifetime in the world of football, so for Portuguese team Benfica and their manager Jorge Jesus, this season’s Europa League final is their opportunity to finally expunge the memories of a nightmare end to last season, which saw them lose the Portuguese League, the Portuguese Cup and the Europa League Final, all in the space of a few days. With the Portuguese Primeira League and the Taca de Liga (League Cup) already secured; Benfica have the chance to win the quadruple in the next week, by securing the Europa League and the Taca de Portugal (Portuguese Cup). For Sevilla, it has been a season where they overcame their bitter city rivals Real Betis in the Europa League, saw their neighbours relegated from the Primera Division, whilst guaranteeing their own place in next season’s Europa League. If Sevilla are victorious on Wednesday night, it will be their third Europa League triumph in less than a decade, following wins in 2006 and 2007. Benfica’s only real disappointment this season will have been their failure to qualify for the knockout stage of the Champions League; but their progress in the knockout stage of the Europa League has been serene, with 14 goals scored and only four conceded in eight matches. They beat Chornomorets Odessa of Ukraine home and away, eased past Tottenham Hotspur 5-3 on aggregate, before beating Dutch club AZ Alkmaar in both games, only to draw Italian champions Juventus in the semi-final. A late goal from substitute Lima gave Benfica a narrow 2-1 first leg victory; with the daunting prospect of facing a rampant Juventus team, determined to reach the final of a competition to be played in their home stadium. Even though Benfica were reduced to 10 men after 67 minutes and despite Juventus dominating possession, the Portuguese champions maintained their defensive solidity to win the tie 2-1 on aggregate and to reach the final. Sevilla reached the knockout phase of the Europa League with ease, scoring 27 goals in 10 games, conceding only six; but their progress after that was far from simple. A narrow victory over Maribor of Slovenia was followed by a penalty shootout win against Real Betis; before Sevilla recovered from a 1-0 first leg loss, to inflict a 4-1 defeat on Porto. With the semi-final second leg well into injury time and Sevilla trailing 3-2 on aggregate against Spanish rivals Valencia, Stéphane Mbia rose above the Valencia defence to head the ball home and give Sevilla a dramatic away goals victory and passage into the final. So based on the information extracted from the SportsMatrix database what can we look forward to in the final? Can Sevilla beat the Benfica offside trap? It would not be a surprise if the linesmen were kept very busy. 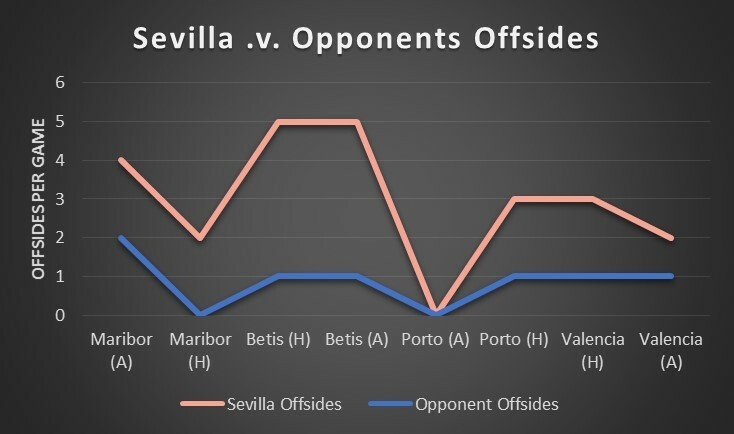 Since the knockout stage of the competition, Sevilla have been caught offside on average 3.5 times per game. 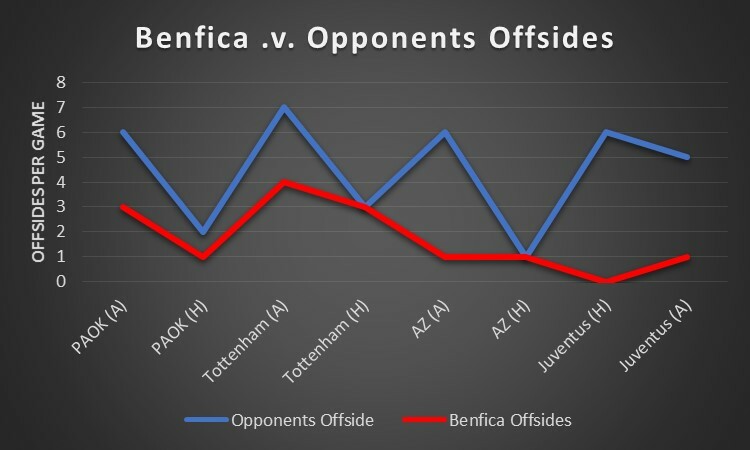 Meanwhile Benfica play a very effective offside trap, with their opponents caught offside 4.5 times per game. Can Sevilla exploit the Benfica backline through counter attacks? The data shows that Sevilla have been successful when they break quickly, scoring four times in the knockout stages from counter attacks, twice against Maribor and one time each against Porto and Valencia. Until now, Benfica are yet to concede a goal to an opposition counter attack. Can Benfica exploit Sevilla’s weaknesses in dealing with crosses? Our data shows that opposition teams delivered on average 2.5 crosses per game against both finalists, with approximately one of these crosses being dangerous. But whereas Benfica conceded one goal from crosses, Sevilla conceded four goals. Will Sevilla be able to breach the solid Benfica backline? 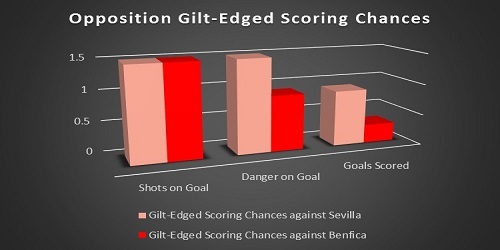 Opposition teams managed to create 12 gilt-edged scoring chances against both Sevilla and Benfica, during the knockout phase. Whilst Sevilla conceded from seven of these chances, Benfica conceded only twice. 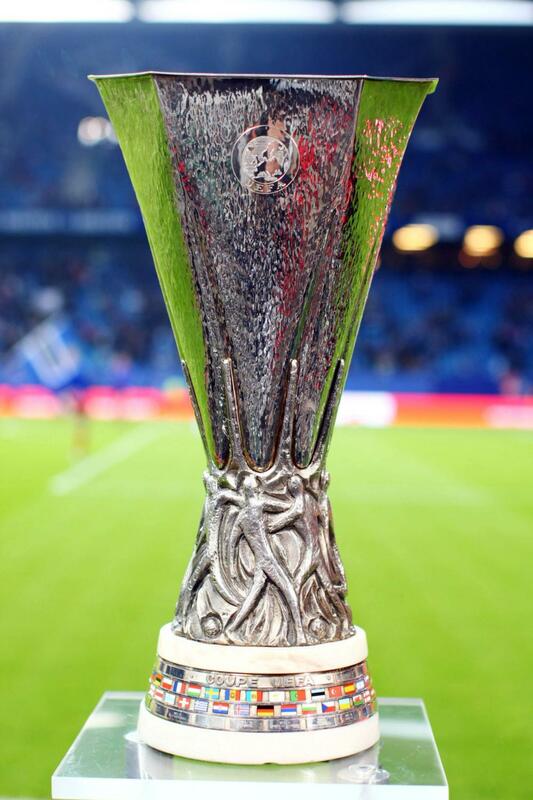 Will Benfica finally end the curse of Béla Guttmann or will Sevilla make it a hat trick of Europa League triumphs? The data points to a hard fought and tight contest, with little to choose between the teams. Sevilla have done remarkably well in overcoming two La Liga teams and last season’s champions of Portugal on their way to the final; but after last season’s disappointments, Benfica, with their rock solid defence, look to be the slight favourites to end 52 years of hurt and to finally lay to rest the curse of Béla Guttmann.